Today was an absolutely GORGEOUS day! Can you say SPRING???? Oh wow, this kind of weather just puts you in the mood for Spring Cleaning or definitely getting outside and doing something! I got up at 8 AM this morning which is WAY EARLY for me! I'm an 11 AM/Noon person. Probably due to the fact that I'm a night owl, too! But I went to bed about 10:30 last night (wow!) and though I didn't sleep soundly and kept waking up, I didn't get up until 8 this morning. Then I showered, got some breakfast, and got the family up and we just had an enjoyable day! Hubby and girls planted two Cherry trees outside that our neighbor (Mayor's wife) gave us from the Garden Club; replanted a Red Bud tree in a different location and hubby and the girls washed the car. The girls were able to play outside today after being in the house often with the past cold weather. It was just great. 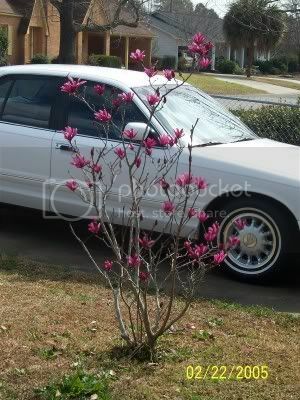 And here is the picture of my Japanese Magnolia, blooming in FEBRUARY! On the crochet front, I have pictures of those two bookmarks I mentioned in my previous post. They turned out real pretty, IMO. This first picture is of them being blocked overnight, just water and pins. I'm using my new quilting board to pin them. 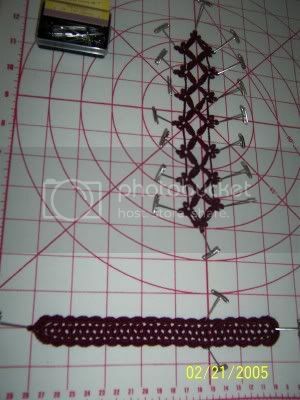 And here they are blocked and with a little beaded "Angel" on them for a charm. Thank you, Coralie, for the idea! And my bookmark on the right looks a lot like Coralie's, but I looked closely and the edging is different. I think that is why mine looked familiar to me...it does resemble others I've seen. And today was a wonderful MAIL day! First, I got a postcard from my Crochetville Secret Pal...a postcard of Berlin! And she's asking me if I've ever visited Berlin...She says that it is a wonderful city. Now either she lives in Germany or she visited and has a postcard from the area and sent it to me to throw me off the scent! Is she from the US or is she from Germany? You're too sly, SP! Thank you for the postcard...I love it! Then I got a package from a Secret Pal from another list...I can't even remember how I got on this Secret Pal list, from what Crochet group.... 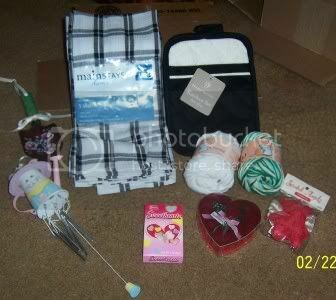 But our theme is Kitchen things, and she sent me some wonderful hand towels and potholders in the black and white theme of my kitchen, along with some other goodies! Look at all she sent, including a cute greeting card which is not pictured. 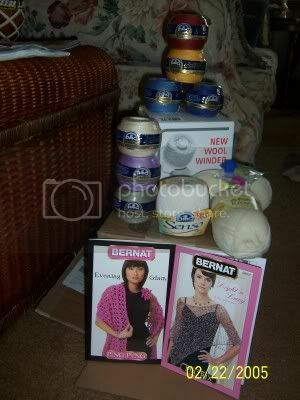 Then part of my Herrshner's order came in and I am now the proud owner of a yarn winder!!! I also received some DMC Cebelia threads in various colors and I must say that I thought I was going to be getting some of those tiny balls, but this is a larger ball than what I expected! I was very happy with that surprise! And look at those knitting needle sweater huggers! Aren't those the cutest things? And then there are two pattern booklets, and some DMC cotton I'd never heard of before so wanted to try, and then two skeins of yarn I hope to use to try my hands at socks. Anyone got any good crocheted sock patterns? I'm willing to try knit socks as long as they're classified as EASY! And then from Zooba, a new book came from my WishList. This is the second book I've gotten from this company, the second month I've been a member, and I really like the setup. All books are $9.95, shipping is free, and they automatically send a book from your WishList in the order you place your books. You can even order additional books at any time for the same $9.95. I think if you want a book sent every other month, instead of every month, it's $12.95, but it's still a great deal, don't you think? Check them out if you haven't already. Thank you, Edith Smith (from HMB), for clueing me in to this company! 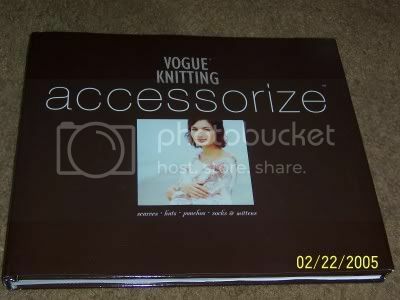 This is the book I got this month for $9.95, Vogue Knitting's Accessorize. Now wasn't that a great mail day? Now I'm waiting for the 2nd half of my Herrschner's order which was my most wanted item, and that is that 3-tier basket to set by my chair and put my favorite yarns on display! I knew it would be shipped separately, but I hope it comes soon...like....TOMORROW??? Oh, and before I go, my neighbor enjoys sewing and she showed me this cutest thing...a Koolaid purse! Can you believe it? 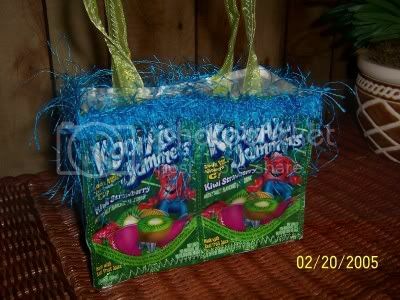 Those are Koolaid Jammer packages, emptied and sewn together, then a beaded fringe around the top, with ribbon handles. It's very cute and I thought very creative, but I wondered if anyone would buy such a thing. But she said she saw the concept in a shop down in Savannah or Statesboro that she was in and they were selling them like hotcakes! (fast!) Guess for how much? $30.00!!! I couldn't believe it! So she wants to make some and will sell them for $20. I don't know if they'll go in this small town, but she has nothing to lose, and maybe some of the girls in Statesboro would drive the 30 minutes here if they knew they could save $10 or if the shop in whatever town doesn't have any in stock. I still can't believe those are selling for $30.... wow. But it is mighty cute. And it looks better IRL than in a picture. What do you think? Yeah! Glad to know you got the postcard okay. :) Hee hee. Thanks for the Zooba tip...I think I'm going to start doing that! I used to belong to a site where you could borrow books, like Netflix, but I just wasn't reading them fast enough to feel like I was justifying the service. But this is really cool..I think my boyfriend would like getting cookbooks every once in awhile too!